Asheville, NC – Much to the anticipation of progressive rock fans worldwide, for the first time, a rare recording of UK prog group Flash, featuring legendary guitarist Peter Banks, from January 21, 1973 will be released on CD on October 29, 2013. Titled ‘Flash – In Public’, this historic and exciting concert recording features the original Flash line-up – Peter Banks, Colin Carter, Ray Bennett and Mike Hough in rare form live at Kansas City’s Cowtown Ballroom. The show was taped on the very first mobile truck for The Record Plant. Flash were on the same bill that evening with The Byrds, who would disband after a few more dates. The shows were all recorded for the Lee Jeans & Cotton concert series – the first nationally syndicated rock concert series! Los Angeles, CA – British progressive rock legends Flash, featuring founding members Ray Bennett & Colin Carter, will be releasing their highly anticipated new CD on Purple Pyramid Records on May 21, 2013. 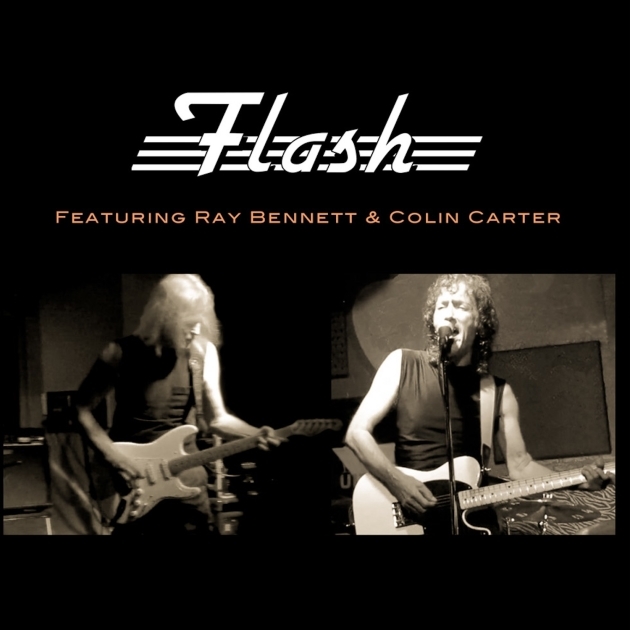 Titled ‘Flash featuring Ray Bennett & Colin Carter’, it’s the first album by the group in 40 years, taking the band to a new level of creativity and virtuosity with this current set of progressive melodic rock tunes. Founded by lead vocalist Colin Carter, original YES member, guitar legend Peter Banks, bassist Ray Bennett and drummer Mike Hough, Flash released three critically acclaimed albums in the 1970’s and undertook several successful tours of the US and Europe. In the USA, the single “Small Beginnings” reached #29 in the Billboard charts, and the first album ‘Flash’ made the top 50, propelling the band into major venues on their first tour. In the US, Flash went from intimate venues like the Whisky A Go Go, to large concert halls like New York’s Avery Fisher Hall, to the wild crowd of 300,000 music fans at the Soda Pop Festival in Indiana. Flash also made high profile performances on TV shows in Europe and the US, including ‘The Midnight Special’ and the Wolfman Jack hosted ‘Superstars Of Rock’. Along with Ray, now on lead guitar, and Colin, on lead vocals and rhythm guitar, keyboardist Rick Daugherty has been added to the line-up giving the band’s sound more warmth and depth. Mark Pardy on drums and Wayne Carver on bass make up the new rhythm section. The album includes five new songs penned by Ray and Colin, two new instrumental pieces, and a cover of NIN’s ‘Hurt’, which the band has performed in concert. There is also a new version of the classic Flash song “Manhattan Morning” from the band’s third studio album ‘Out Of Our Hands’.